Easily grown in average, dry to medium, well-drained soils in full sun. Tolerant of a wide range of soils and growing conditions. Puts out lots of growth in moist, fertile soils, but is less apt to topple in dryish, infertile soils. Freely self-seeds in optimum growing conditions. This grass develops an extensive root system and is somewhat slow to establish, but, once established, has excellent drought tolerance and is easy to maintain. Cut stems to the ground in late winter before new shoots appear. 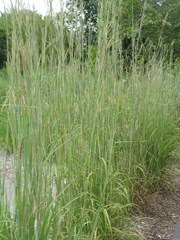 Andropogon gerardii, commonly called big bluestem grass, is a tall, Missouri native, perennial, warm season grass that was the dominant grass of the tallgrass prairie which once covered large parts of the Midwest. It may be grown as an ornamental grass because of its attractive foliage which changes color seasonally, its good architectural height and its interesting flower/seed heads. It features an upright clump of stems with flattened leaves (to 2' long and 3/8" wide) which emerge gray to blue green in spring, mature to green with red tinges in summer and turn reddish bronze with lavender tones in autumn after frost. Flowering stems rise in late summer above the foliage clump bearing purplish 3-parted, finger-like flower clusters (to 4" long) purportedly resembling turkey feet (hence the additional common name of turkeyfoot grass for this species). Flowering stems bring total height of this grass to 4-8' tall (typically at the taller end in moist soils and the shorter end in dry soils). Genus name comes from the Greek words aner or andros meaning man and pogon meaning beard in reference to the hairs on the spikelets of some species in the genus. Specific epithet honors Louis Gerard (1733-1819), French physician and botanist. Best massed in wildflower meadows, prairie or naturalized areas. Also effective in border rears or native plant gardens as a screen or accent. Extensive root system makes this a good grass for erosion control.